With the St Lucia celebrations taking place last week, the popular saying "may St. Lucia take care of your sight" was a good reason for beginning the “Looking Ahead" campaign, promoted by Novartis and boasting the collaboration of the Macula and Retina Institute. The initiative is aimed at preventing pathologies like AMD or diabetic retinopathy, which affects a large proportion of the over-50s and which, with early detection and proper control, should not cause patients to lose their sight. The Institute's Director, Dr. Jordi Monés, participated in the campaign and gave an interview on the Cadena COPE radio station's morning programme in which he highlighted the most important aspects of an initiative in which various medical centres took part. For Dr. Monés, "the importance of detecting the disease in time is vital so one of the messages of this campaign is prevention through simple exercises the over-50s can do at home. For example, by covering one eye and checking that objects like the horizon don't appear twisted. The aim of “Looking Ahead” is to publicise this type of message and create awareness among the population. . According to the Director of the Macula and Retina Institute, "the centre's involvement in this campaign takes the form of awareness programmes for persons at risk, such as diabetic patients, who should be aware that diabetic retinopathy should not result in blindness these days, with timely detection and the right treatment of the disease." 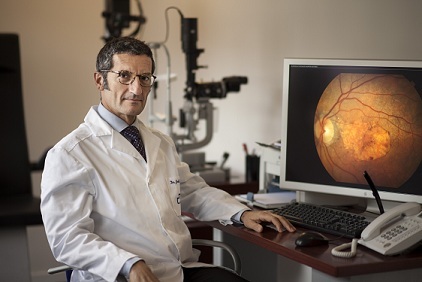 Finally, Dr. Monés spoke of the turning point in 2005, when new treatments were discovered which brought about “a shift from the middle ages to the modern age in curing eye diseases such as wet AMD or diabetic retinopathy".